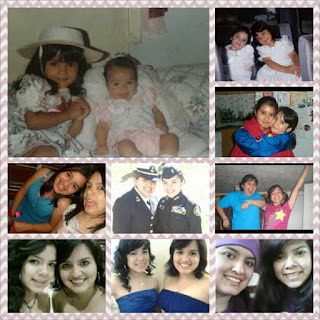 Yesterday was "National Sister Day". It seems like each day is a "National" something day, for example today is "National Watermelon Day". Anyways, back to sisters. I have one of those, and occasionally I like to call her Ramona. Even though 21 years ago I picked her name to be Ruby. As I was going through my Facebook timeline and Instagram feed, there were two sister that kept popping up. Anna and Elsa, which I love. I like the focus they made in "Frozen" to their sisterhood and the power it can hold. However, I do not see my sister and I like that. As far as I know, neither one of us has special powers. Well maybe she does, she just does not want to tell me. So until she decides to come clean, I think of our relationship as Ramona and Beezus. Yes, the Beverly Cleary characters. If you have ever seen the movie for 'Ramona and Beezus' you pretty much already know what my sister and I are like. Ruby is creative and outgoing. She always tries to help, and just like Ramona I would not trust her in the kitchen. Then there is me, I tend to be the bossy one. Although, I like to use the term knowledgeable. Between my sister and I there is a 3 year age difference, just like the characters. Which meant, although there were some things we were able to do together, there were some we weren't. There were moments where my sister felt ignored because I had different things to things to do. As there were times where I felt she was annoying and a pest. We shared rooms up until I was 21. We spent late nights talking about things that bothered us, making fun of each other, and sharing things that made us smile. I am blessed to have that bond with someone. We can go on and on, with the similarities that we have with the movie, but then this would be more of a book .I am sure you get the idea though. Our relationship is not perfect. We can make fun of each other, but we are always there to listen to each other. That is what I love the most about us. Maybe she is still annoying. She is no longer a Pest. She keeps me on my toes. 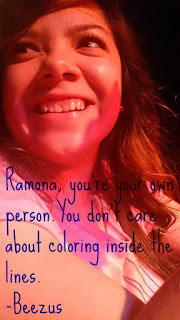 She will always be my Ramona. I love you too Ramona. That is what you get for leaving me. Sisters are the best! My sister and I have a similar age difference so we've also gone through that "oh my little sister is such a pest" stage, but now we've moved onto a friendship. It's great having someone like that to rely on and have fun with. Yes, thankfully we are now at the age where we can both do everything together. *gasp* I even miss her! Cant deny that she is one of the few that get me. Awww thanks! I really just loved reading Beverly Cleary books, never realized the similarities between the characters to my life until I got older.